The Duke of Gloucester = World Cup 2014 HQ for Brits! Bad news: it’s Monday. Good news: England recently qualified for the World Cup 2014! 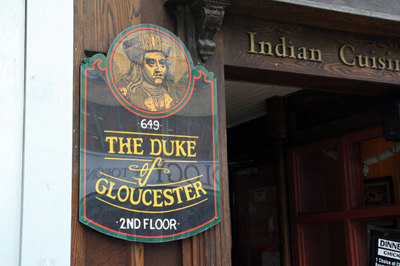 And today I’m launching a stellar campaign to make The Duke of Gloucester pub on Yonge Street (between Bloor and Wellesley) the OFFICIAL World Cup HQ for Brits in Toronto. I’m totally biased … let’s get that out of the way so there’s no accusations of bribery or conflict down the road. I consider it my local and have been going there a good number of years. Having experienced a couple of World Cups/Euros there, I can attest it’s the place to be for live games. The place is jammed, seats are at a premium, usually CP24 or CityTV show up and film the joy and anguish on the faces of the collective Brits that come together as one for games. The atmosphere is electric and the support when another English penalty shoots over the goal is heartwarming. So … more details and campaign news to come down the road. But, let’s start getting excited! ENGERLAND … ENGERLAND … ENGERLAAAANND … ENGERLAND … ENGERLAND … ENGERLAAAANDDDD!! This entry was posted in Uncategorized and tagged brits in toronto, england football team, the duke of gloucester pub, world cup 2014 on October 22, 2013 by britsintoronto. Half Price Wings! Half Price Wings! Half Price WIngs! (mondays / wednesdays w/ a pint) Their honey-hot sauce mixture is outstanding.